These Eco-Alternative diaper covers are created using Eartheasy's Eco-fi (formally Eco Spun) fiber utilizing recycled soda pop bottles. A viable end-use for our recycled PET containers! This is a scrumptiously soft, highly breathable diaper cover. 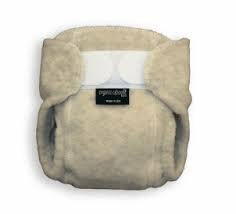 It's a great alternative to wool and a superb nighttime cover. Features fold-back washing tabs. Made in USA.